After months in the making, our new 2013-2014 full color 32 page magazine has arrived at The Welcome Center. The purpose of the publication is to showcase all that our beautiful resort has to offer. We included numerous articles that would be beneficial to anyone looking to relocate here as well as lots of photos of TGO. Feel free to stop by and pick up a copy at The Welcome Center, or call us, and we will be happy to mail it to you. 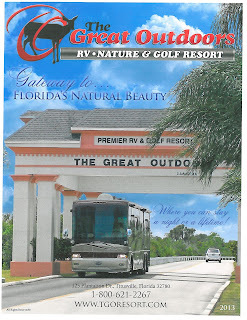 If you have a fellow RV'er you think might enjoy a copy, let us know, and we will take care of that! Contact us at 800-621-2267 or email us at info@tgoresort.com.